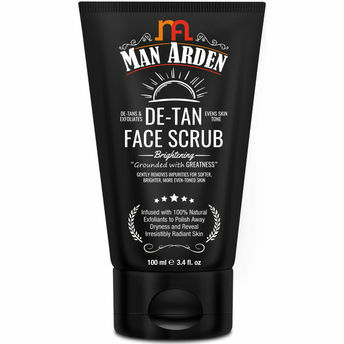 Man Arden De-Tan Brightening Face Scrub is a formulation comprising of several exotic and therapeutic natural ingredients that help transform the tired, dry, dull, dusty face into a vibrant, soft, bright, unblemished, youthful face. It contains vitamins potent antioxidants, anti-inflammatory, and anti-aging agents helps to eradicate skin disorders, alleviate aging effects and promote healthy skin. This scrub contains tomato seed oil, oats and cedarwood for cleansing and exfoliating and helps to remove the dead skin cells and clean the pores and skin surface. Most of the ingredients are effective in warding off the harmful effects of UV radiation on skin and act as anti-aging agents. About the Brand: India's No.1 Mens Grooming Brand, Man Arden creates exquisite products specifically designed to suit all types of skin imperfections and enhance the male skin. Understanding men's skin and needs, Man Arden products deliver quick absorption and lightweight formulation your skin demands, and targets specific concerns with powerful custom-fit solutions. Get high-tech, high-performance men's skincare products that give real results. Try it and see for yourself!